MLK Dr. Martin Luther King Jr. Spread over two series, 2005 Topps Baseball features one major rookie card and a handful of secondary stars. Series 1 has 367 cards with Series 2 having 367 cards. A complete set is numbered up to 734. This is because there is no number 7, which was retired by Topps in 1997 in honor of Mickey Mantle. 2005 Topps Baseball has a clean design. Thick white borders give way to a colorful inner frame. The player's name and team run vertically up the side of the frame. The last name is repeated in bold foil across the top. The team, year and Topps logo are at the bottom. 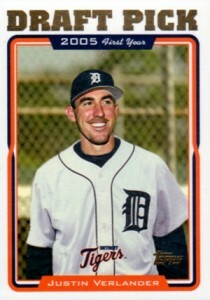 The best card in 2005 Topps Baseball is the Justin Verlander rookie. Other first-year cards in the set include Ian Kinsler, Billy Butler, Andre Ethier and Melky Cabrera. Card 263 is an uncorrected error. Despite being a Michael Young card, it pictures Rod Barajas. Gold (#/2005) and Black (#/54) are the only parallels. 2005 Topps Baseball has a ton of regular inserts. Barry Bonds played a big role in the set. Topps launched the Barry Bonds Home Run History set, which would carry over several sets and years, with cards for each of the controversial slugger's first 330 home runs. He was also the focus of Bonds MVP, a set celebrating his seven Most Valuable Player awards. The production run for each card varies, with early MVP wins thee rarest. Relic and autograph versions also exist. Dem Bums is a 21-card insert set celebrating the 50th anniversary of the 1955 World Series champion Brooklyn Dodgers. With a design inspired by 1955 Topps Baseball, autograph and cut signature versions add to the chase. Other basic inserts include the foil-heavy Hit Parade, Hobby Masters, Own the Game and Grudge Match. Although rare, the autograph checklist has some big names like Alex Rodriguez, Miguel Cabrera, Felix Hernandez and David Wright. Memorabilia cards include All-Star Stitches Relics and On Deck Circle Relics. Celebrity Threads Relics are not a pop culture-inspired set. Rather, it features retired stars like Ozzie Smith, Dave Winfield and Cecil Fielder. 2005 Topps Baseball also has several different factory set configurations, each coming with their own exclusive cards. Some of these sets have the first Topps cards of key players. Although oddball inserts and not official rookies, they can be somewhat tough to find as not a lot of factory sets are broken up and sold. Depending on the factory set version, highlights include Ryan Braun, Jay Bruce, Ryan Zimmerman and Rickey Romero. 2005 Topps Updates and Hightlights Hobby Box - Factory Sealed!